Governor Andrew M. Cuomo today announced that the MTA will begin testing on countdown clocks for lettered-subway lines and digital screens for MTA buses. Later today, the MTA will begin its 90-day test of countdown clocks in eight subway stations along the N, Q and R lines, with the aim of installing the clocks in all 269 lettered-line stations. In addition, the MTA today awarded three contracts to perform a pilot program on 131 buses for the installation of digital information screens – to ultimately be installed on a total of 3,600 buses. These vital investments advance Governor Cuomo’s plan to transform the MTA into an innovative, state-of-the-art system with improved customer service and first-class amenities, and are part of the $27 billion, five-year MTA Capital Program. Testing will be performed at the 23rd Street; 28th Street; 34th Street; 42nd Street; 49th Street; 57th Street; 5th Avenue/59th Street; and Lexington Avenue/59th subway stops, and will include two countdown clocks with enhanced LCD screens. The LCD screens, which look much like computer screens, have the added capability of exhibiting public service announcements and other content – a step forward from the LED digital display screens currently in use. Countdown clocks currently serve 176 stations, including the L line’s 24 stations, and will ultimately be installed throughout all 269 lettered-line stations. New Technology For Countdown Clocks: The new clocks rely on technology that is straightforward, cost effective to deploy, and does not require large infrastructure. The system uses the existing wireless network in the stations and cloud computing, and involves four Bluetooth receivers placed in each station, two at each end of the platform. These receivers communicate with four Bluetooth devices that have been installed in the first and last cars of each train set running on the line. As the train enters and leaves a station, the system uses its arrival and departure time to estimate the time at which the train will reach the next stop in the line, and display the arrival times on the two LCD display screens that have been installed at each station. Proof of Concept Phase For Countdown Clocks: During the 90-day test of the clocks, the MTA will work to identify and correct any issues with the new system. The goal is to evaluate the accuracy of location data, performance of Transit Wireless infrastructure, performance of the LCD displays, physical and network security of Bluetooth devices, security of data being transmitted, and internal access and use of data being generated. MTA today awarded three contracts for a new pilot program to install digital information screens on 131 buses, with the aim of extending to 3,600 buses, as part of Governor Cuomo’s plan to fully transform, renew and expand the MTA network. The B46 SBS, a Brooklyn route that travels from Williamsburg Bridge Plaza to Kings Plaza Shopping Center. The S79 SBS, which goes from Bay Ridge, Brooklyn to the Staten Island Mall. Under these contracts, 131 buses will be retrofitted with these screens for the pilot, which will test and evaluate the designs and technology for use on NYC Transit’s fleet of diesel, hybrid and articulated buses. The MTA is in the process of identifying a fourth vendor for the pilot. Each bus will be retrofitted with vibration-proof digital screen technology that can simultaneously control two to three digital screens on the bus, depending on its size (standard 40 foot buses will each have two screens, while articulated buses will have 3 screens). Each system includes a video processing unit and a content management system to allow remote programming. Beginning in 2017, new buses delivered to the MTA will also come with digital information screens. 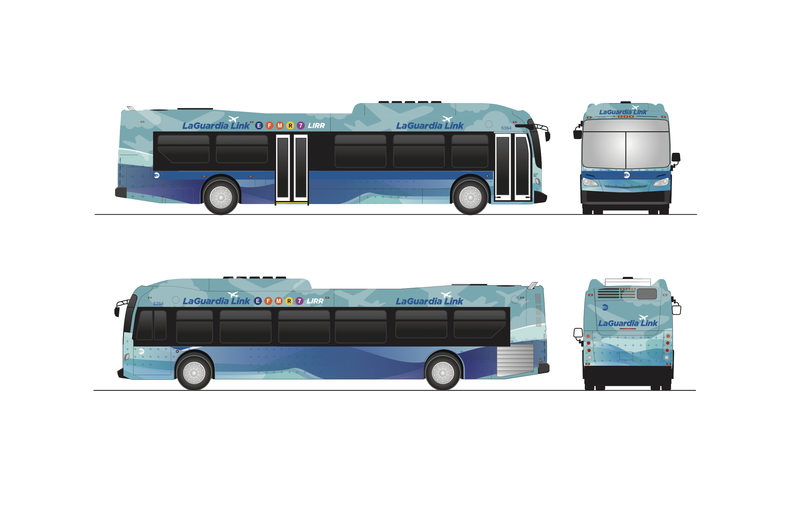 Over the next five years, more than 2,000 of these state-of-the-art buses will replace nearly half of the MTA’s current bus fleet, and the existing fleet will be retrofitted with digital screen technology. The pilot for digital screens on buses is part of a larger $2 billion investment in its bus system, including $1.3 billion on the new fleet for local and express service. The introduction of 2,042 state-of-the-art new buses with WiFi and charging ports to the MTA fleet over the next five years. Pilot programs for new technologies aimed at improving customer and passenger safety, including a pedestrian warning system, will be installed on 200 buses, and a new collision avoidance technology system will be installed on 145 buses. After the successful completion of this test, the technologies will be installed on 1,600 buses starting in mid-2018. The relaunch of the Q70 Limited bus service as “LaGuardia Link” with a distinctive new look designed to help customers and tourists quickly find their way between LaGuardia Airport and two regional transit hubs in Queens that connect to five subway lines, Long Island Rail Road and seven bus lines. The route, nicknamed the “LaGuardia Link,” will also become a Select Bus Service which employs convenient off-board fare technology that allows customers to pre-pay their fare and enter and exit through any bus door, eliminating the need to wait to pay at a single fare box, and decreasing dwell time at stops. The LaGuardia Link will also continue to offer travelers convenient luggage storage racks.